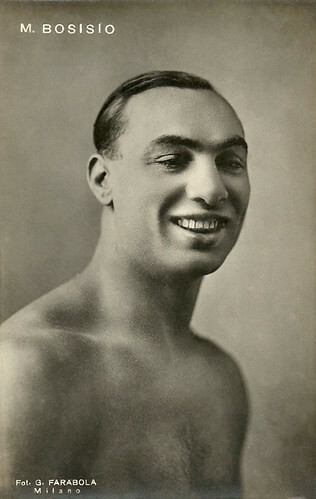 Mario Bosisio (1901-1988), alias Mariolino, was an Italian welter weight champion boxer, who also appeared in two films. Italian postcard by G.B. Falci Editore, Milano. Photo: G. Farabola, Milano. Marco Bosisio was born in Milan, Italy, in 1901. He debuted as professional boxer in 1920. In 1923 he first battled for the title of Italian welterweight, which he lost in 15 rounds on points to Abelardo Zambon. At the following occasion, in 1924, Bosisio challenged Pietro Brichetto and won the title, which he successfully defended until 1930. A year later in Rome, he conquered the title of European welterweight, winning on points in 15 rounds from the Dutch boxer Nol Steenhorst. A first attempt in late 1924 had failed, when he reached a break even in a match of 20 rounds against the ruling champion, the Belgian Piet Hobin. Bosisio defended his European title until 1927, when for reasons of weight he had to switch to a superior category. In 1928, Bosisio conquered the European title for the middle weights, winning on points in 15 rounds from the Frenchman Barthelemy Bert Molina, but less than three months after he had to let go of his title to Leone Jacovacci. He won it back, however, in 1930, beating the great French champion Marcel Thil on points in 15 rounds. After defending his title in 1931 against Enzo Fiermonte, in June of the same year Bosisio had to give up his title to the Austrian boxer Leopold (Poldi) Steinbach, and in October 1931 he also lost from Fiermonte. In 1932 Bosisio withdrew from boxing. Vera Bergman. Vintage postcard, no. 506. Photo: Ghergo. Collection: Marlène Pilaete. Mario Bosisio acted in two films. During the war he acted in Il campione/The Champion (Carlo Borghesio, 1943), about an ex-boxer turned trainer who discovers a new talent, whom he hopes will win the Italian championship. Bosisio’s former rival Enzo Fiermonte played the trainer, while Bosisio himself had a small part in the film. 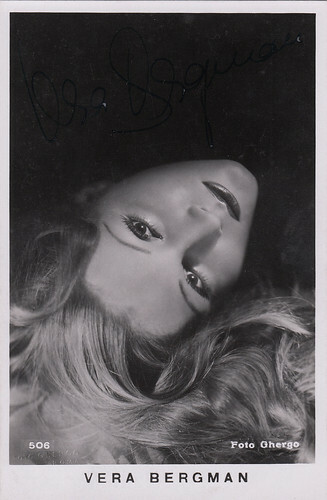 German actress Vera Bergman played the female lead. Fiermonte had delivered the idea for the film as well. Fiermonte had a highly active acting career after quitting boxing. He acted from 1941 to 1981. Bosisio played in 1952 a second, slightly bigger but still modest role as Mr. Carlo in another boxing film, Serenata amara/The bitter serenade (Pino Mercanti, 1952). It was the story of two close friends (Claudio Villa and Walter Santesso) who have drifted apart because of the girl both love (Lilian Bonfatti). A fitness centre owner (Gianni Rizzo) sets up the two friends against each other, although he knows that one is mortally ill. Many boxers and ex-boxers played in the film. This was the end of the brief film career of Mario Bosisio. He died in his hometown Milan in 1988. Sources: comingsoon.it, Wikipedia (Italian) and IMDb.